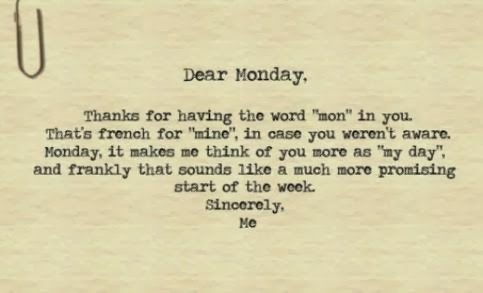 The Daily Bluapple: Dear Monday. Hello and Welcome. I am sure many of you experienced what I do in the mornings, especially on a Monday. The weekend is over and the experience of opening up your eyes and having all day to complete your tasks on your own time table are over. Yes, Mondays can feel like a weight on your shoulders or a death sentence. I woke up this morning at a dead run. But it wasn't a run of trying to get stuff done. It was a run to get out of the house and be on my own. My 13 year old had his friend over to spend the weekend with us, and my older son had his girlfriend over as well as she took a break from her college life to spend it with us in Utah. I am used to only cooking for four people. Three days of cooking for six was a little hard on me, along with activities and sleeping arrangements and arguments over whose turn it was to use the TV in the game room. I made everyone homemade pancakes and a fruit smoothie for breakfast, sat and sipped my coffee while listening to plans for the day being made. I smiled as I gathered my things, kissed foreheads and cheeks goodbye, wished everyone well on their adventures and walked out the front door. I stared my car, turned the station to one of my choice and sang along to a Def Leppard tune as I headed towards the freeway.